the 2019 Budget Working Group (Mayor, Councillors Gillingham, Mayes, Rollins, Gilroy, Allard, Orlikow, Chambers and Santos) MAY include the required budget ($1M) in the 2019 budget – and IF they include, and IF the budget passes – we would see improved snow and ice removal on sidewalks and pathways for the 2019 – 2020 winter season (~Nov.2019 –April 2010 and beyond). I encourage you to contact the Budget Working Group and ask that they include the $1M in the 2019 Budget. I’m pleased to have initiated this very significant change in the snow removal policy. If the above noted surplus does not occur in 2018 then the above noted amendments to the Council Policy on Snow Clearing and Ice control take effect in 2019 and beyond. A new list of sidewalks and pathways throughout the city has been identified and prioritized for snow removal. This INCLUDES all the pathways located in Waverly West neighbourhoods. In March 2016, I requested the City’s Public Works department to review the current snow and ice removal policy for sidewalks and pathways and provide recommendations on how to improve it. The report has been delayed now FIVE times and is expected to be presented in February 2018, TWO YEARS after I originally requested the study. I am confident the Public Works department has had more than adequate time to review this matter and develop a plan and budget to improve snow and ice removal on sidewalks and pathways. I do not fault the department. The Mayor has the final say in what reports appear on the agenda. This report is not coming forward with cost estimates because of a decision by the Mayor. Clearly, improving snow and ice removal on sidewalks and pathways is not a priority for the Mayor and his Executive Policy Committee. My thanks to CBC News for reporting on this issue. 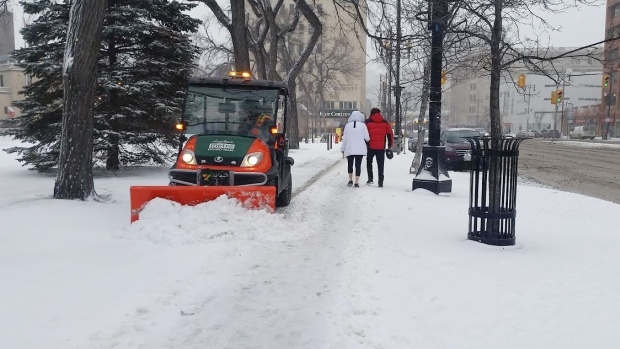 A Winnipeg city councillor is fed up with how long it’s taking city officials to respond to a request she made more than 1½ years ago for information on ways the city can improve how snow and ice is removed from sidewalks and pathways. South Winnipeg-St. Norbert Coun. Janice Lukes made the motion in March 2016, when she was chair of the city’s public works committee. The motion asked the public works and transit departments to meet with stakeholders to work out a strategy to improve the service, and to report back with how much those changes would cost. Lukes said the groups have since met but she’s still waiting to hear about the details from city staff. “They haven’t come back with answers,” she said. “It didn’t ask them to go out and do it. It just said let’s study it; let’s find out if there’s cost implications, bring it back to the committee and then we could go from there. Lukes said city staff have asked for an extension from the public works committee several times since she made the motion, and she was frustrated to see it come up again on the agenda for the committee’s meeting Tuesday, once again with no report attached. The task of clearing sidewalks is currently handled by the same contractors hired to clean the regional street they run along, Lukes said. She thinks having two separate crews — one for streets and another for sidewalks and the city’s active transportation networks — might be a solution. And with snow removal contracts coming up for renewal next year, she thinks now is the time for the city to start looking at making changes. While navigating uncleared sidewalks can be tricky for everyone, it’s especially difficult for Winnipeggers living with disabilities, said Allen Mankewich, who uses a wheelchair and is an advocate for people living with mobility challenges. The city can do a better job clearing snow and ice from sidewalks and pathways, he said. Mankewich said he lives and works downtown because downtown streets are a priority, meaning they’ll be cleared sooner, but he has lived in the suburbs, where the sidewalks are cleared less regularly and not as quickly after major snowfalls, he said. Lukes said the city has already increased and improved snow removal from sidewalks around schools, and she wants to find a way to expand that level of service to other areas of the city, including the suburbs, especially around community centres and seniors homes. Connie Newman, executive director of the Manitoba Association of Senior Centres, said poor sidewalk conditions in winter leave seniors with two options — getting out and risking a fall or staying cramped up inside their homes until the thaw. “When you get stuck in your house because the public sidewalk is too slippery to walk on, what are we doing to the citizens?” she asked. Newman is just as frustrated as Lukes by what she sees as a lack of action on the issue by city staff. Fraser noted that in 2008, Winnipeg won the American Public Works Association (APWA) Award of Excellence for snow and ice control.